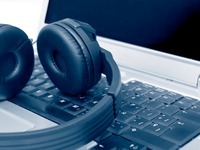 Four music companies have settled a 54 million yuan (US$8.6 million) music piracy lawsuit with Chinese Internet company Sohu and its search engine, Sougou, and will now allow users in China to download songs for free. A China.com.cn report Sunday said Universal Music, Warner Music, Sony Music Entertainment Hong Kong, and Gold Typhoon Entertainment signed a settlement agreement with the two Beijing-based companies. The music labels agreed not to pursue the 54 million yuan (US$8.6 million) music piracy lawsuit, while Sougou said it would donate an undisclosed amount to the International Federation of the Phonographic Industry's (IFPI) anti-piracy fund. The music labels and Sougou also signed an agreement to allow Internet users in China to download and stream songs for free from Sougou. The search engine will pay royalties and licensing fees to the four music labels which will upload their full music collection and upcoming new releases. Chinese search leader Baidu inked a similar deal in July 2011. The search engine agreed to pay royalties and copyright fees to Sony, Universal Music, and Warner Music, to allow its users to stream and download music legally for free.